The geek-driven podcast where a group of film industry pros and Special Guests discuss all aspects of genre entertainment. So expect a lot of talk about classic horrors, dinosaurs, black lagoons, monsters from the Id, time lords, final frontiers, galaxies far, far away and, of course, planets where apes evolved from men. 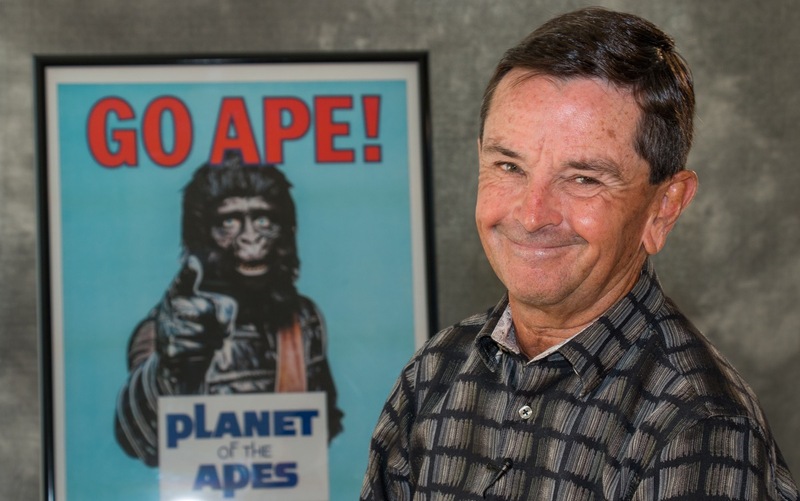 The Damn Dirty Geeks are very fortunate to be joined by our second PLANET OF THE APES franchise veteran, renowned actor, stuntman and stunt coordinator Bobby Porter. We had such a great time talking with Bobby about his appearance as Cornelius in BATTLE FOR THE PLANET OF THE APES and many more of his films, that this episode is Part 1 of 2 shows featuring our star guest. Bobby Porter, as you'll soon hear, is one of the most charismatic, positive and inspirational people you could meet. Not only does Bobby have dozens of fascinating and fun stories to share with listeners, but he always places these tales in context of influential moments of growth and achievement in his life. Part 1 of our visit with Bobby covers the start of his stunt performer career, how his size that led him to double for child actors in THE POSEIDON ADVENTURE and ACE ELI AND RODGERS OF THE SKIES lead him to an opportunity to play young Cornelius, the son of Roddy McDowall's Caesar in BATTLE FOR THE PLANET OF THE APES. Bobby also shares stories of the Disaster genre boom of the 1970s and doubling as John Connor in TERMINATOR 2. Stream or download now, and read our full Episode Notes on our Damn Dirty Geeks website. ©Damn Dirty Geeks is © 2014 Sketchy Things Productions. All rights reserved.